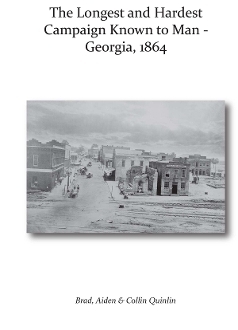 The longest and hardest Campaign Known to Man Take the journey of the Atlanta Campaign with the words of the men who fought it. There are almost 400 letters that take you into the campaign and fighting of the summer of 1864. Many of these letters were found in the mother’s pensions in the National Archives in Washington D.C. These letters have never been used in any other work on the Atlanta Campaign. Brad spent 12 years going through mother’s pension to gather these letters. Many the last letter the men sent home to their mother.